and stomp your stuff or you can just sit back and enjoy the music. Combine that with local beer and food and you can't go wrong. * Pipe band members are those performing at the Massed Pipes and Drums event on the Saturday night. There will be a bar and local Pasties. Option 1 via the A39 - On the main A39 between Barnstaple and Bideford, turn off before crossing the new high level Torridge Bridge on to the A386, at the roundabout take the 1st exit towards Bideford, follow the road for just over a mile until you reach a mini roundabout at the end of the old bridge next to the Royal Hotel. Take the 1st exit under the old railway bridge, follow the road up the hill for about 0.3 miles and turn right into Avon Road, just past Whiteland Engineering. Straight on at the next roundabout and the venue is at the end of this road. 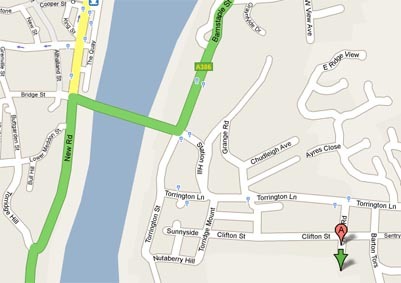 Option 2 via Bideford Quay - At the mini roundabout at the end of the old bridge take the 1st exit and travel over the bridge and you will reach another mini roundabout at the end of the bridge next to the Royal Hotel. Go straight across and under the old railway bridge, follow the road up the hill for about 0.3 miles and turn right into Avon Road, just past Whiteland Engineering. Straight on at the next roundabout and the venue is at the end of this road.